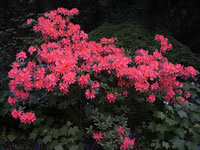 When you are shopping for a Rhododendron or Azalea, there are many factors to consider. Whether it is sold in a pot with it's rootball wrapped in burlap is of little consequence, nor is the size of the plant. as well as the eventual size of the plant and how cold hardy it is. Some have fragrant flowers (mainly Exbury Azaleas). All Azaleas are members of the Rhododendron family but not all Rhododendrons are Azaleas. They can be low growing, and never reach a height of more than two feet, but others can grow as tall twelve feet. You can use these facts to your advantage and purchase plants that will give you an extended blooming season by choosing a few of the very earliest blooming and a few late flowering varieties. Plantings can also be staggered by size. It is best to buy plants which have been grown outdoor and locally, which pretty much insures that the plant is hardy in your area. Rhododendrons and Azaleas can be planted at any time of the year, even when they are in bloom, but it is best to plant them in the early fall so they have a chance to adjust to their new home before winter comes. They must be grown in an acid soil, with a pH of 5.0 to 6.5. Rhododendron and Azalea plants will not tolerate lime. Many nurseries will test your soil pH for free, and give you recomendations for improving your soil. but receive at least partial shade during the very hottest part of the day. Dig your planting hole twice as wide and 1 1/2 times as deep as the rootball. Mix compost and peat moss into the soil. Add course builders sand or grit if it is necessary to improve your drainage. When you remove the plant from the pot, use your fingers to loosen up the roots a little to get them to grow into the new soil. When you plant Azaleas or Rhododendrons, they should be placed in the ground so that their root ball is slightly higher than the surrounding. They will resent it if soil is pushed up against the trunk. 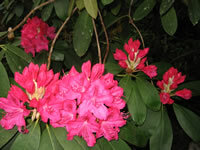 Sprinkle a small amount of Rhododendron food into the hole at the dripline of the plant. Fill in the hole and water it very thoroughly. 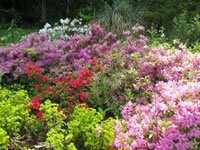 Azaleas resent drying out, so use some kind of mulch to conserve moisture in the soil. You can use leaves, bark, compost or whatever. The buds for next years blooms will be formed this year, so it important that the faded blooms are removed, otherwise you will not get a flower on that stem next year. An acid type Rhododendron fertilizer should be applied after the plant has finished blooming. Rhododendron pruning consists mainly of removing the spent flowers, and cutting back longer branches which may spoil the symmetry of the plant. To have flowers in bloom all year long will take planning on your part, using a combination of shrubs, bulbs, annuals and perennials. Many flowering shrubs bloom very early in the spring. Others bloom all summer or well into the fall months. Here again nursery tags can be very helpful. You can find plants which will flower during any month of the year, and combine them to create a year round flower show.